This incredible barn shed is the perfect choice for those seeking a large, stylish and high quality storage solution. It offers a private, secure place to store your equipment, machinery and tools thanks to the windowless design and built on Rim lock. The 12mm thick tongue and groove cladding also adds to the shed’s security, as well as providing essential rainwater protection. One highlight of this building is its fantastic height. Thanks to the unique apex roof, the rain will simply run straight off the shed onto the floor below. However, it isn’t just great protection from the elements that the apex design offers. It also gives you extra height; particularly in the central part of the building. So if you frequently find that you have to duck as you enter the majority of sheds, this is an excellent choice. For peace of mind, the manufacturers have also provided a 10 year anti-rot warranty. A lot of features have been added to the building to ensure it really withstands the test of time. Both the exterior and the interior of the shed have been built with strength, stability and durability in mind. The barn style doors and roof really do give this shed a lot of character and will help your garden to really stand out. It offers a great level of space, yet it benefits from a compact exterior size to ensure it doesn’t take up too much space in the garden. Natural unpainted design, though we feel this gives it a more authentic, rustic style. 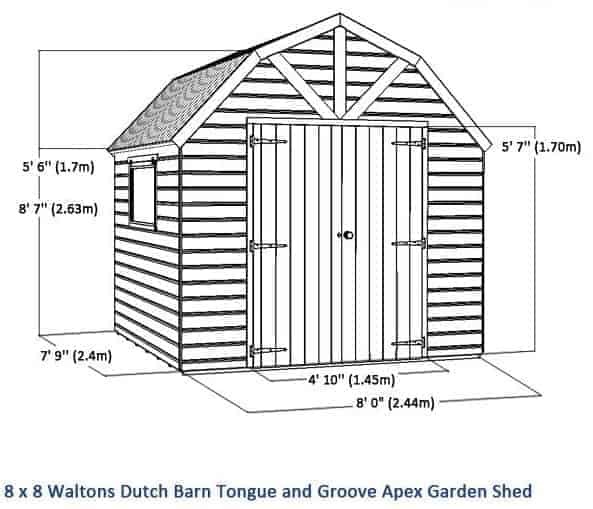 This is a medium size Dutch Barn style shed created with thick, high quality materials. Its unique barn style apex roof helps to ensure rainwater drains easily away from the building; minimising the risk of damp and rot. It is also covered with a heavy duty mineral felt to further enhance the lifespan of the building. What you may not realise is that the shape of the roof also gives the shed a taller design. So storing tall items won’t be an issue and if you’re on the taller side yourself, you won’t need to worry about ducking down when you enter the shed, or once you’re inside. This gives it a much more comfortable design. We like that although the interior of the building provides a good amount of space, its exterior is actually pretty compact. It measures 2.42m wide and 2.37m deep. So it should fit comfortably into most gardens. The roof measures 2.62m high and the shed’s eaves measure 1.64m high. This extra tall design gives the shed a much more dominant, striking design. 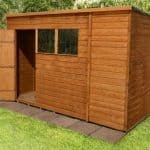 You also won’t need to worry about accessing the shed as the double doors measure 1.70m high and 1.47m wide. With 12mm Shiplap tongue and groove cladding, this shed benefits from a long-lasting, durable design. The boards form a tight seal which prevents rainwater entering the building. 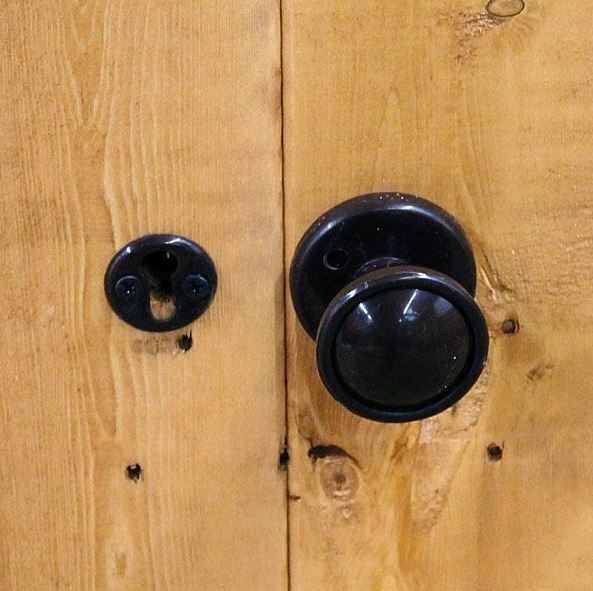 It also helps to deter thieves as the wood isn’t easy to break through. You’ll notice that Shiplap cladding sheds come at a slightly more expensive price than other types of cladding. This is because it is the most durable and the highest quality cladding that is currently used on outdoor buildings. For this reason it is only ever used to create high-end sheds. Tongue and grove is also an important feature as it leaves a good expansion gap; allowing for any swelling and warping that occurs in the timber due to seasonal temperature and moisture changes. Without this useful gap, the changes that occur could potentially cause damage to the structure. In order to support the thick materials used on the shed, a strong 45mm x 27mm framing has been included. You will also be impressed with the thickness of the floor. The company has included a 12mm tongue and cladding roof and floor, which ensures you can store heavy things such as lawnmowers, BBQs and heavy boxes. The fact this shed boasts an all-round thick, sturdy construction in both its interior and exterior design highlights just how good quality it actually is. Sadly the shed does need to be treated before it is covered by the 10 year anti-rot warranty. It is also important to ensure you use a spirit based treatment rather than a water based one. This is because the spirit treatments provide a much stronger, deeper level of protection. They soak into the wood and form an internal barrier, prevent rain water from seeping through. Water treatments simply create a barrier on the surface. The frequency of treatments will depend on which brand you buy. Some will require annual re-applications, whilst others may protect the building for longer. As long as you follow the manufacturer’s directions for maintenance, you will be covered by the 10 year warranty. 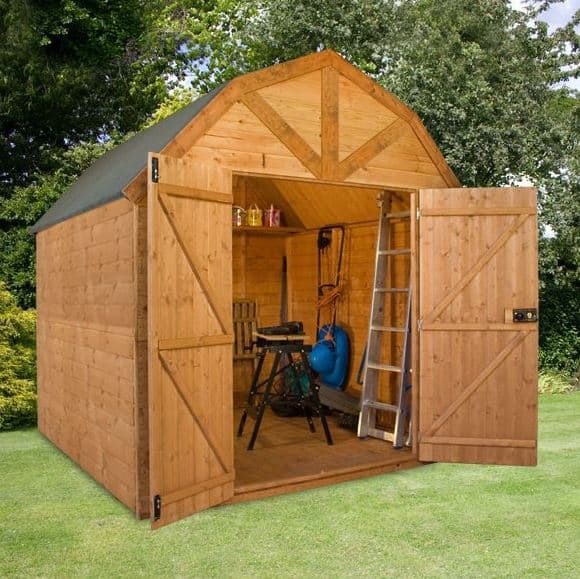 This shed comes with great sized double doors and they also benefit from a strong, durable ledge design. Featuring thick cross-beams, the doors are kept firmly in place and will not sag over time. They are also secured with a high quality Rim lock. You can tell a lot of effort has gone into making them strong and protected against both the elements and potential thieves. There aren’t any windows on this barn designed shed so lighting may be something you need to consider. It is possible to buy an electrical pack which will enable you to add light into the building. 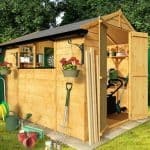 It will also let you turn the shed into a workshop and provide a power source to plug in tools and machinery. These are pretty expensive however and they can be quite tricky to install. 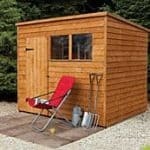 You can tell just from the look of this shed that it has been manufactured with security and privacy in mind. No windows means it is impossible for anybody to see what is stored inside. It also gives you the privacy you need if you’re going to be working in the building. Its solid cladding and frame also makes it hard work to break into. Then you have the addition of the Rim lock which really boosts its security. All in all it is a secure shed so we do recommend it to those looking to store valuable equipment. 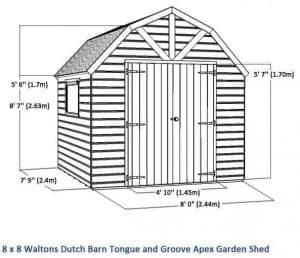 There isn’t a massive choice of extras available with this shed, but that’s merely because it doesn’t really require anything extra. You also just have two customisation options. The first is a choice of different coloured superior duty felts. These tough roof coverings are constructed from fibreglass and are very easy to install. They will lengthen the life of the roof, providing even more protection against the elements. Available in Charcoal or Olive Green, this felt isn’t really an essential upgrade, but it can help to give the shed a slightly different look, as well as boosting longevity. The second customisation option available is the extra strength floor support pack. Now usually this is something we would highly recommend. However, this shed already features a tough 12mm tongue and groove floor. We only tend to recommend the extra strength floor support pack if the building comes with solid board materials, rather than tough cladding. It’s also worth pointing out that Waltons supply a free floor support kit which is slightly weaker than the extra strength edition, but it could still improve the overall strength of the floor. 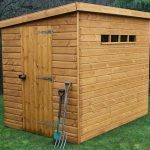 So in our opinion the extra strength pack isn’t needed with this shed, but it could be useful if you are storing extra-heavy boxes or machinery. As for the extras, the weatherproof padlock with hasp and staple is a good investment. The padlock benefits from a tough steel laminated body, a double locking feature, protective cover over the keyhole and a Thermoplastic weatherproof jacket. It’s one of the highest quality padlocks we’ve seen and will really help to strengthen the shed’s security. Other extras aren’t really necessary unless you are planning on turning the shed into a workshop. There’s a cordless drill and a 2-piece spirit level set available. You can also invest in the Drapers 5 Tread Aluminium Step Ladder. This is the only real item out of the Draper accessories range that you might find useful if you’re just using the shed as a storage area. Finally it’s worth mentioning that Waltons also give you a free Golden Brown 5L tub of treatment free with this building. This adds to its overall value for money as unless you want a different colour, you won’t have to pay for the shed’s treatment for at least a year. There’s a lot of things we like about this shed and its quality is the main one. Not only does it boast an attractive Dutch Barn design, but it also features strong, high quality Shiplap cladding. Even the frame has been given a thicker design compared to a lot of other sheds, helping to further improve its quality and longevity. As the shed is designed with tough cladding, it benefits from a naturally long-lasting finish. If you didn’t have to maintain it via annual treatments we would have given it a 10/10 rating. You have a good amount of space to store anything from bicycles to BBQs and heavy machinery. There’s also the option to attach shelving thanks to the strength of the Shiplap cladding. 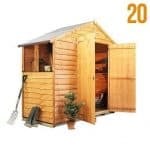 You’ll see on the picture included on the manufacturer site that the shed has an internal shelf. It is important to note that this isn’t included. It is simply there as a reference to show that you could install shelving if you wanted to. If it wasn’t for the weight of the panels and the hard labour involved, we’d have actually given this a 10/10 rating for ease of installation. It’s really easy to put together and you are provided with everything you need to fully assemble it. You should also find that it doesn’t take too long to install. Expect to have it fully assembled within 3-4 hours depending upon how many people are helping. 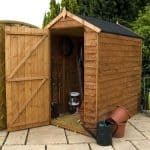 This is one of the best value for money sheds we’ve come across. Despite being made from the highest quality materials and boasting impressive longevity, the shed comes at a very affordable cost. You also don’t need to spend money on expensive extras. The annual treatments are the only long-term cost you have to worry about and as you are supplied with a free tub of premium quality treatment, you don’t even have to worry about that for the first year. Final Thoughts: This is a beautiful building that will really add style to the garden, as well as provide you with a practical storage solution. The 12mm Shiplap tongue and groove cladding ensures a long lasting design, while the extra strong planed and rounded frame helps to give a very stable structure. Its double doors open out to a very spacious interior. We recommend taking advantage of the thickness of the cladding by installing interior shelving. As it doesn’t have any windows, you have total peace of mind that all of your tools, machinery and equipment will be 100% safe from prying eyes.